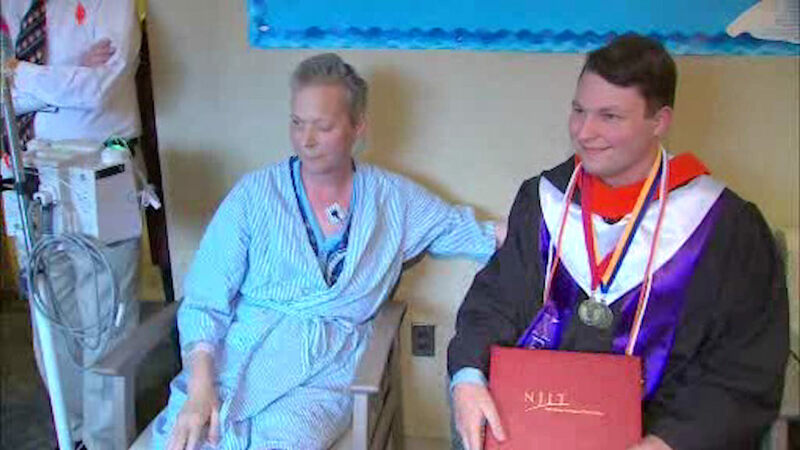 HACKENSACK, New Jersey (WABC) -- There was a special graduation celebration Tuesday for a family in New Jersey. Howard Forstrom is at Hackensack University Medical Center undergoing treatment for prostate cancer. He couldn't attend his son's graduation from NJIT, but he was able watch it on a computer in his hospital room. Then, while he knew his son was coming afterwards, to his and his family's surprise, the hospital staff had organized a party. "He's guided me with problems with professors, how to accomplish a project best," said Gregory Forstrom, NJIT graduate. "I've gotten the chance to mentor him as he's gone through and it's been a good bonding experience," Howard said. Father, son, and the whole family enjoyed a graduation party organized by the hospital staff.